In 2014, culture360.org invites a number of special correspondents to get an insight on issues that are highly discussed in the cultural sector across Asia and Europe. 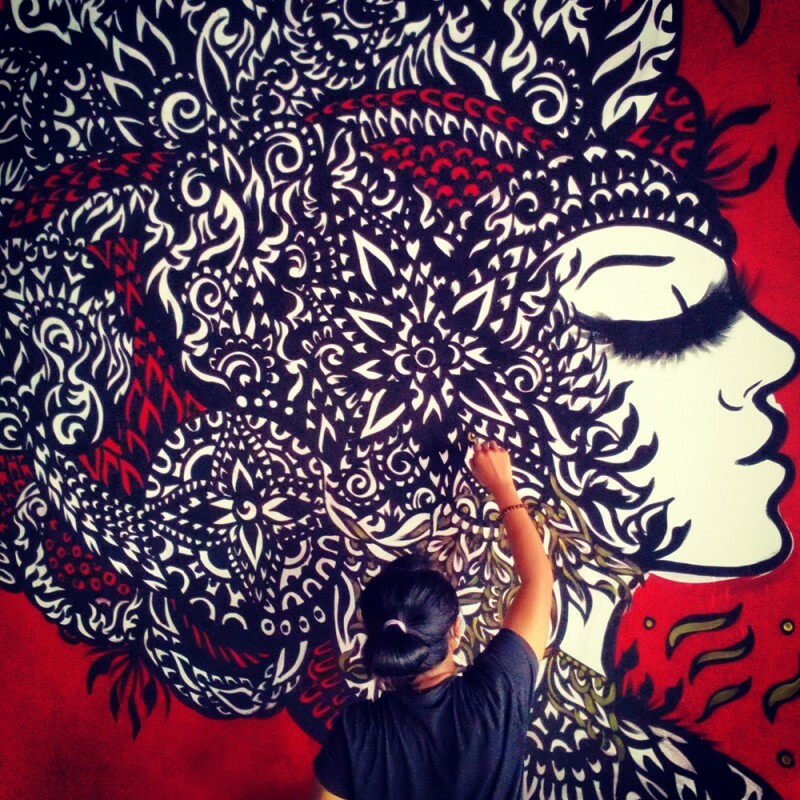 In this second article, Magali An has interviewed a young artist whose unique artwork has blossomed on the walls of South East Asia from Phnom Penh Cambodia to Bangkok Thailand. Considered as the first female street artist in Cambodia, Lisa Mam appears as a pioneer in her country which was long considered as the cultural "Pearl of Asia" before the civil war. 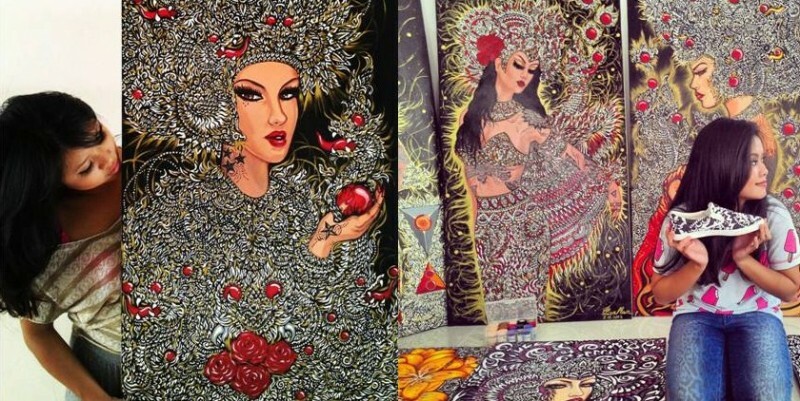 Though her art, she is encouraging a young khmer generation to take pride again in their culture and find their own voice. Cambodia is evolving fast, with a dynamic youth hoping to forget about the wounds from the Khmer Rouge and to renew their national pride. Lisa Mam aka « Lil Dots », a young urban artist coming from Phnom Penh, appears as the perfect embodiment of this new energy. 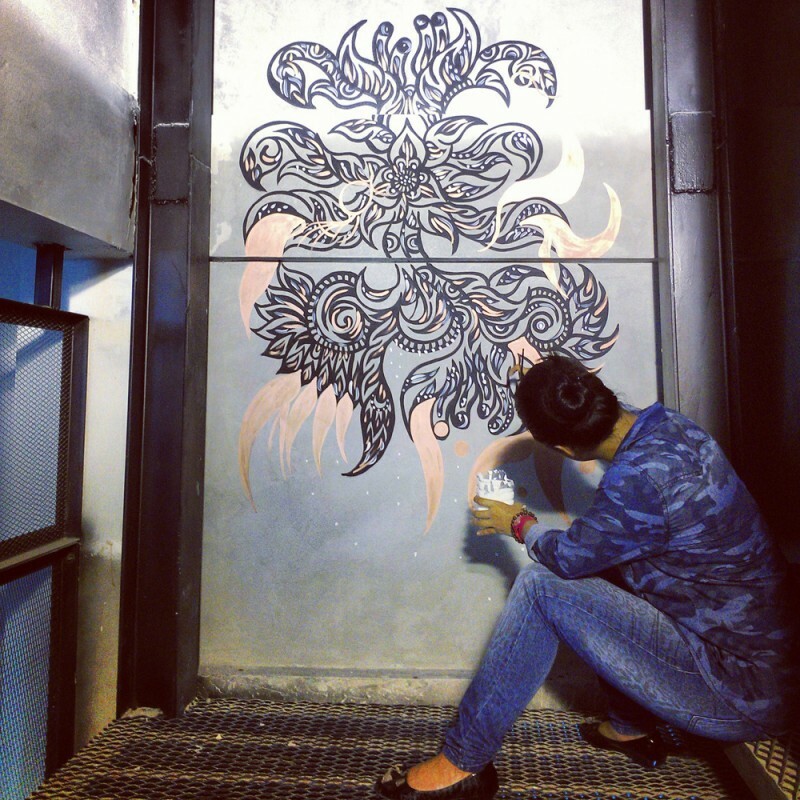 As the first official female street artist in Cambodia, she has been perfecting her unique style since 2010 and has been featured in several collaborative exhibitions throughout South East Asia. Considered as a rising star in Khmer urban art, she is the image of her generation: leaving their fears behind, eager to build bridges between East and West and dedicated to bringing their country into modernity. Who are you as Lisa Mam and how did you embark on your artistic journey? My name is Lisa Mam, I am 24 years old. I was born and raised in Cambodia and I live in Phnom Penh. I started drawing and sketching at a very young age, around 6 years old if I remember correctly. I must say that I had some natural talent at it but it was not so easy for me to choose this path. My parents did not really believe in my calling and they pushed me to drop it and encouraged me to focus on my studies. After that I stopped practicing my art for a really long time. I then started drawing again as teenager. At the age of 21, I met Peap Tarr in Phnom Penh through friends. He is a renowned half New-Zealander half Cambodian street artist with valuable experience in the international street art scene. When I saw his work and how he was painting, I felt a real connection with my art. There were some striking similarities with my own style. This encounter gave me a lot of hope and it inspired me to continue to paint and to push it further. Since then, Peap Tarr and I keep collaborating together. People started to notice me when I was painting in the streets and it was really new in Phnom Penh, they had never seen such a thing. So this was very exciting to be a part of a new movement. Does your country Cambodia inspires you in your art in any way ? My work is definitely Cambodian. My culture really inspires me, it is unique and special. Cambodia is really a rich country artistically and culturally, especially when you see the splendour of ancient arts from the Angkor ages. It really inspires me and I try to make something different out of it, make it really my own style. I have looked a lot at the decorative elements on the Angkor temples near Siem Reap. For example, the Apsara dancing goddesses appearing as stone carved sculptures on the Angkor temples are strong symbols of femininity and women power and I regularly use these figures in my paintings. The idea is to start from ancient art and culture and to turn it into something new which would fit with our modern society. Peap Tarr and I are committed to creating a specific South East Asian style, along with other artists from Malaysia and Thailand. Street art and graffiti usually come from the United States and westernized countries, so there is much to do to build another visual style. We are also dedicated to sharing our passion for our culture and our country towards the younger generation, to encourage an art community to grow again in Cambodia. Even though I feel that I am an artist, I am still studying and I really enjoy it. I am currently in my graduation year of dentistry studies. So in a typical day for me, I go to my Dental University in Phnom Penh during the day time for practice and then I will work on my painting at night. 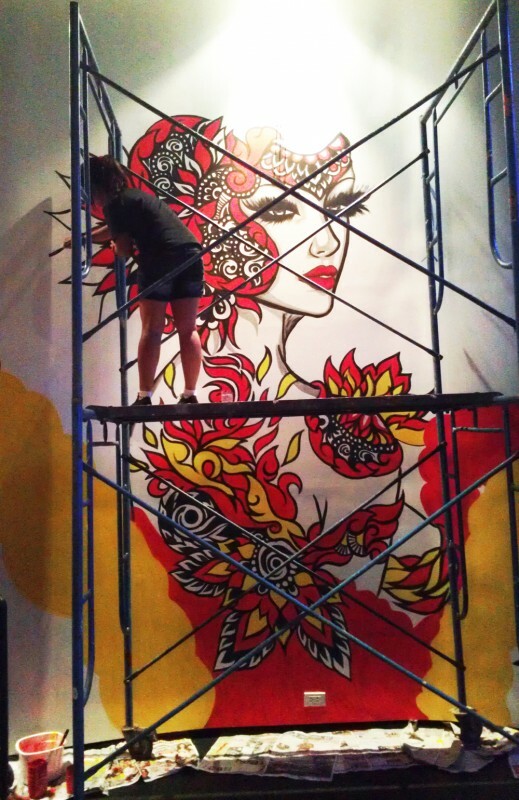 My work is getting more and more recognition so I have been commissioned to paint walls for certain hotels and institutions not only in Phnom Penh but also in Thailand in Bangkok. I get the opportunity to travel and dedicate myself full time to my art during these work sessions. I don't need much material to work, which is something that I appreciate. I only need brushes and acrylic colours. They are quite easy to use and speed up my painting process. I usually use bold and strong colours to get visually graphic effects: black, white, red, gold and silver are my favourite. How is street art considered in Cambodia? And what do you intend to express through your art? I think that the urban culture in Cambodia is quite new and for a long time it was only the expatriates and visiting tourists who would paint in the streets. Now I feel that more and more local people like me. My partner Peap Tarr and another Cambodian graffiti artist called Tone are starting to draw attention from all the Khmer people when they discovered us painting in the streets and getting involved in an increasing number of artistic projects. There is a great feeling of pride to be recognized as the first urban female artist in Cambodia because art is truly my passion. I feel very lucky for that. This is what I love to do with all my heart and soul. My goal is to inspire the young Cambodian generation to develop their own sensibility and taste without copying from other cultures. It's really important to cultivate your own identity. It helps other people realize where you come from and express who you really are. I do not use art to deliver a political message. It is not my purpose. I would say that somehow my art is feminist, inspired by woman power. To me women represent love, compassion and peace and I would like the people who look at my artwork to experience a moment of bliss. The world needs peace. That's my message!